I met this great couple in Aspen, who were vacationing from Santa Fe. She is a potter and has this ethereal beauty about her and a sweetness. We had an instant connection! 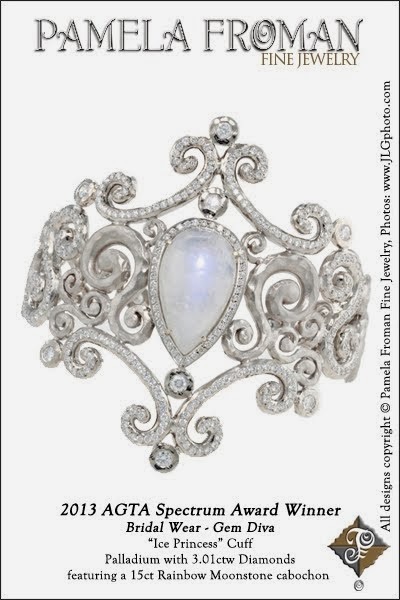 She was wearing an engagement ring that her husband had commissioned for her many years ago, and she said it had just never felt like her style. When she saw my Cognac Diamond "Harlequin Solitaire" Ring (shown above), she fell in love, so we decided to put her engagement ring's diamond (which is little bigger than the Cognac), in my setting. 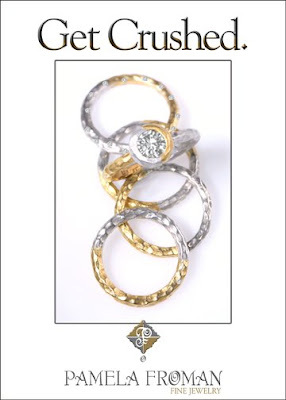 Her husband then picked out 2 of my "Harlequin Sparkle Circle" Rings to stack on each side. 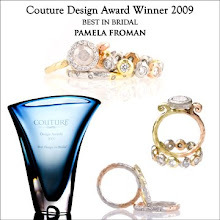 I Photoshopped a couple of pictures, to get an idea of what her rings will look like; they are all Platinum and 22kt gold, which is going to be beautiful. She is very excited to get her new engagement ring, and I'm excited to make it for her! "Do not go where the path may lead, go instead where there is no path and leave a trail". 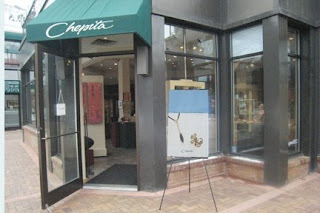 I just returned from a great trunk show/personal appearance in Aspen at a gallery named Chepita. It was an amazing show; not only was it successful in terms of sales, but I met some great people! I loved meeting the clients who enjoy collecting my work. Seeing what my creations mean to them makes it all seem worth while. The people who work at Chepita are great too, and I really enjoyed hanging out with them. They were fun people, very knowledgeable, and they promoted the show extremely well, too: Chepita put half page color ads in the local newspapers for a week, put a full page ad in one of the local magazines that is in all of the hotels, sent out a ton of postcards and also gave stacks of the cards to all of the hotels. 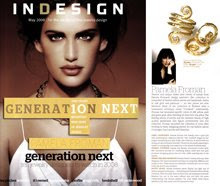 On top of that, Aspen Magazine did a wonderful editorial on me for this month! 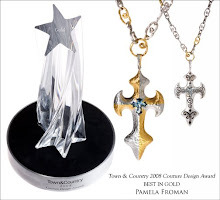 I had a staggering amount of interest in my one of a kind "Gothic Harlequin Cross", which was featured in the newspaper ads. I ended up selling the original piece and getting a special order on a custom version of it! It was very hard to part with that piece, it felt so personal... but I loved how happy it made the woman who bought it! 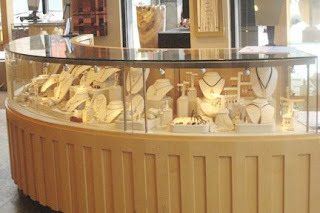 Below are pictures I took of the Chepita storefront, and my jewelry on display inside. Isn't it a beautiful store?! (The picture above is the view from outside my hotel.) I also attached a picture of the Gothic Harlequin Cross, to commemorate its sale. I'll miss it, but now I get to make a new version! 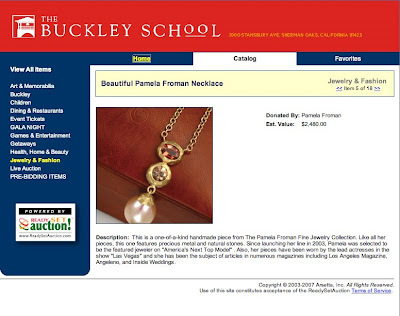 Pamela Froman recently donated a beautiful one-of-a-kind necklace ("The Roman Pearl" Necklace, created from 18k Yellow Crushed Gold, Pink Tourmaline, Malaia Zircon, and a Pink South Sea Pearl) to The Buckley School's 75th Anniversary Gala Silent Auction. This K-12 Sherman Oaks, CA school is founded on the motto, "Dare to be: Brilliant, Creative, Strong, and True." This motto sums up their philosophy of a 4-fold education plan which seeks to balance academics, the arts, athletics, and moral development. 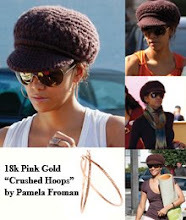 I finally put together a little slide show of the trip Pamela and I took to Tucson to shop for gems. 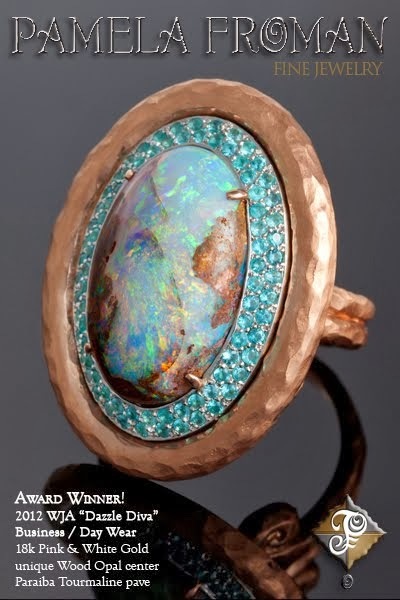 The annual Tucson Gem & Mineral Show is actually many shows rolled into one, but the main show is AGTA (put on by the American Gem Trade Association), which is where we spent a lot of our time. 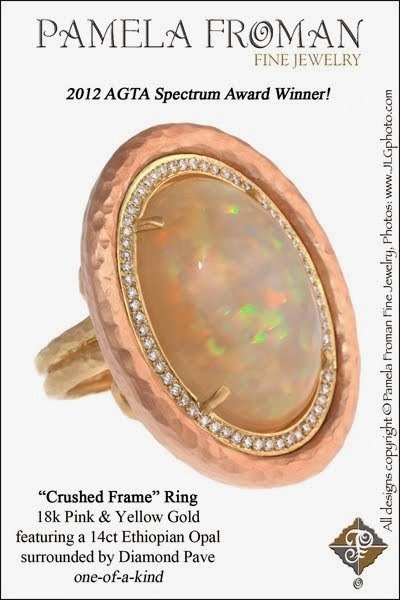 Pamela's a little camera-shy, so the only person you'll see in these pics is me, but most of the images are of gemstones anyway. The stones you'll see are some of the pieces Pamela considered buying, except for the big hunk of Fluorite crystals, which I just had to take a picture of because it looked so cool! (I was going to tell you which stones we kept and which we took a pass on, but I think a little mystery is a good thing.) Enjoy the show! If you're going to be in Aspen this weekend, you're in luck! 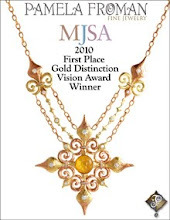 Pamela Froman will be at Chepita of Aspen this Friday and Saturday, and she brought lots of gorgeous jewelry with her! 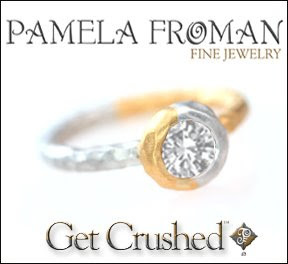 Although you can find Pamela Froman Fine Jewelry at Chepita year-round, this Trunk Show is a special treat; so, if you're in Aspen, take a break from the slopes and drop by 525 East Cooper Ave. to see the latest from Pamela Froman! 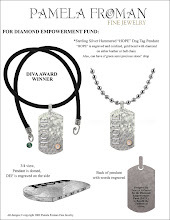 I just had to show you this beautiful new piece for Spring! I'd like to introduce the "Sunburst Crush" Pendant... isn't it gorgeous?! 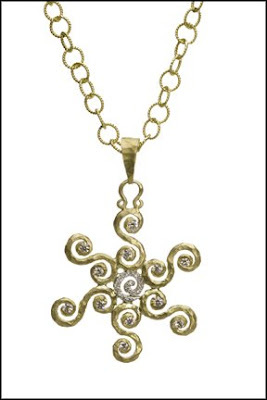 This piece is made of 18k Yellow Crushed Gold with an 18k White Diamond Pave Scroll center (the scroll-y rays have diamond accents as well, for that extra sparkle!) Shown on a light-weight textured cable chain, this fun and flirty necklace is the perfect addition to any Spring Wardrobe!